This big Double Corona is jam-packed with yummy full-bodied flavors of oak, espresso, and spice. Fans of this famous brand will settle for nothing less when choosing their cigars. Packaged in a box of 25. This is a good smoke if you like to share. Not my favorite, but do smoke them from time to time. A medium to full bodied stick with flavors of coffee and wood. Slightly spicy and good. Good overall construction, draw and burn. I love these. I don't like this size as much as the 3 or the 4. These are the best in the larger ring gauge in my opinion. I had quite a few of these a while ago. I found them to be inconsistent. A lot of plugs and knots. The smaller Vitolas are where the rich flavor is at. I rarely have an issue with them. Among many cigars in today industry this one is in a top ten. Always been. Great smoke, reasonably priced. The double corona is a great evening smoke. 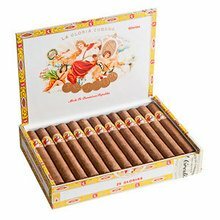 Like I said in past reviews- La Gloriabis quality and second to none. La Gloria is alway a great smoke. 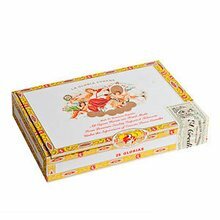 It has a excellent draw, burn,ash,flavor and finish. You alway need to have a stash of these smoke available in your humidor. You need to kick back in you easy chair and enjoy one of these bad boys. Wow nice and rich smoke from this bad boy. Huge clouds billowing from start to end. 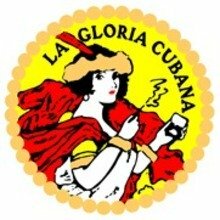 La Gloria Cubana... well, you really can't go wrong. Burns good and always consistent. A sweet and woodsy taste with an excellent finish. Tends to be bold when first lit. After a few draws it settles in and you have a nice one hour smoke. Lots of earth and wood flavors and enough pepper and spice to please my picky taste. Sturdy and holds up well to a nervuous wet bit. Good afternoon or night time smoke. Splendid cigar. Well constructed with a nice smooth draw. Nice flavors burns well throughout. LA Gloria is an excellent smoke.